Byron Bay-based not-for-profit company One Vision Productions needed a new online presence for their growing list of programs and courses. The new website required a safe place for mentors and mentees to communicate as well as e-commerce functionality so that students could book their creative courses online. We kicked off the project by developing a silo architecture sitemap framework to accommodate a significant amount of new content for the upcoming programs and courses. With the structure in place, we set out to create a user interface that provided the best user experience possible. A simple yet popular design was adopted to ensure visitors were able to find the content they were looking for in a few clicks. With lots of excellent content available through One Vision Productions video production offerings, a dark WordPress driven theme for the content areas was used to make the videos pop. For the mentor’s area, we used a membership plugin that allowed for private content for each mentee. While for the e-Commerce booking system, we used WooCommerce with the bookings and product add-on plugins to allow visitors to choose a date and time of their preference for all available courses, as well as adding extra optional extras in the checkout. Overall the web design is clean and inviting, showcasing OVP’s great work, while also providing a hub for users to engage. 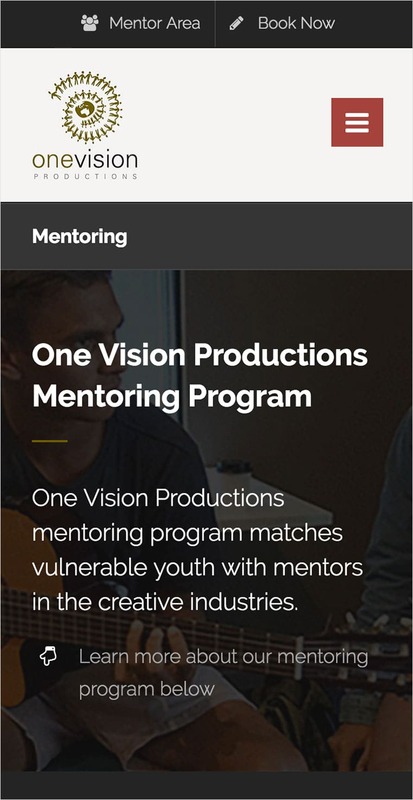 One Vision Productions now has an online presence which allows secure and private communications between mentors and mentees. It also has a way for students to book their creative courses online, meaning greater efficiencies for both administrators and users. Damien is prompt, reliable and dedicated. We Build Ideas are great web designers and any issues we have are addressed immediately. Did you like One Vision Productions? Reach out to us today to find out how we can help you.